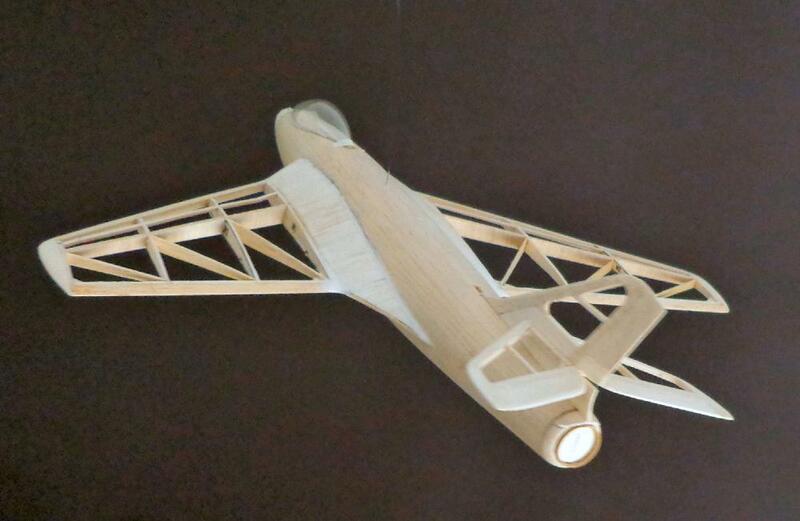 Rather than do any more 'balsa bashing' I decided to attach the wings to the fuselage. 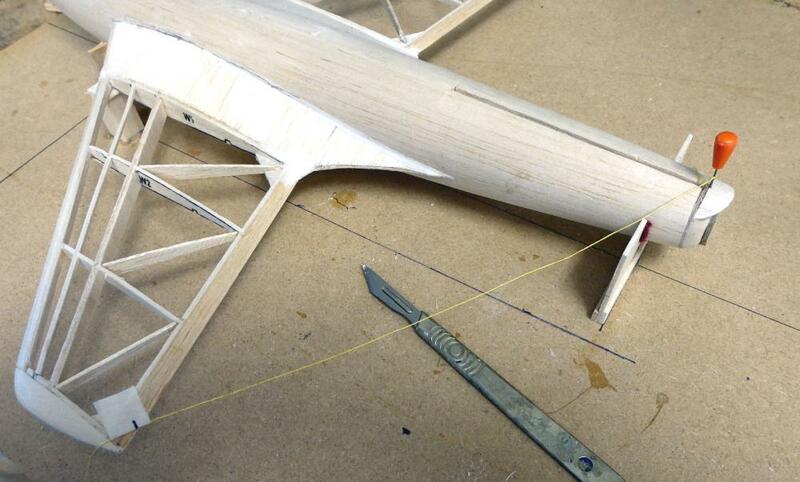 Gluing wings to a fuselage is a somewhat fraught procedure - get the angles wrong and the two sides don't match and you end up with a skewed model that won't fly straight. 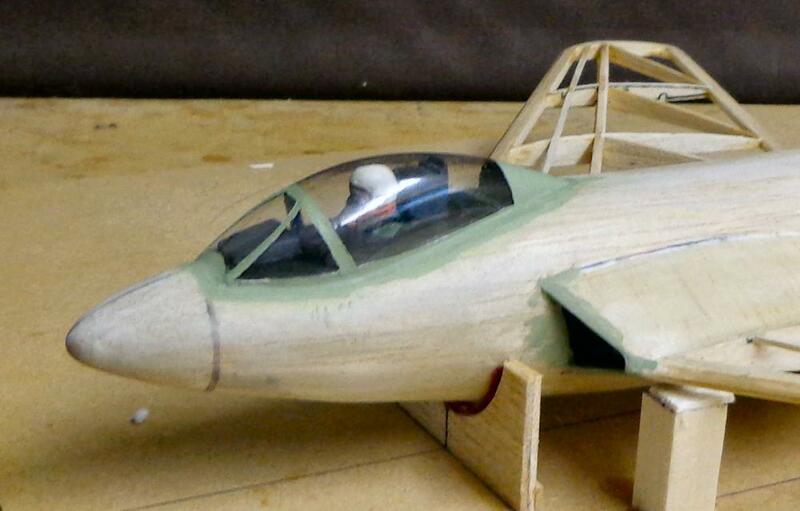 Jetex/Rapier models also fly fast so any inaccuracies will result in disaster on the flying field. 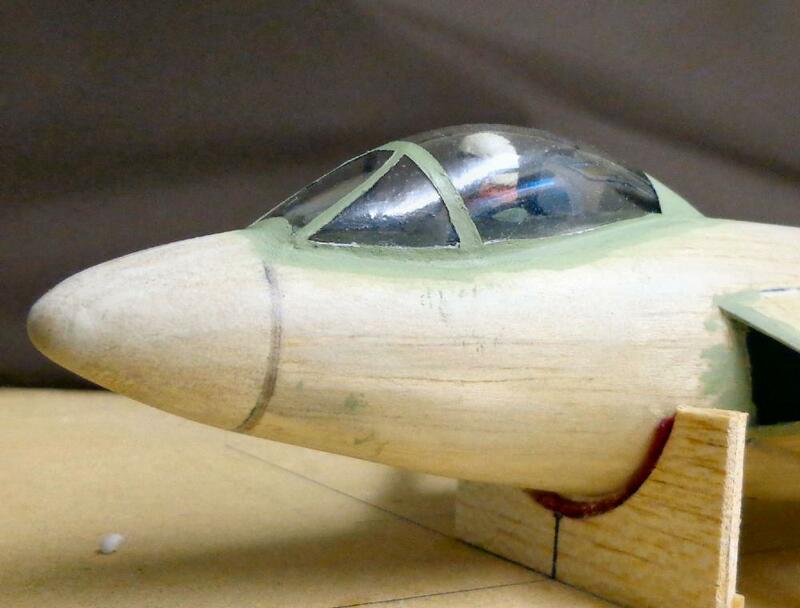 Above: the Jetex Gnat on its intricate jig. This slotted together and ensured all the flying surfaces were straight and true, and the dihedral on either side matched. Well that was the theory! The white is Red Devil lightweight filler. 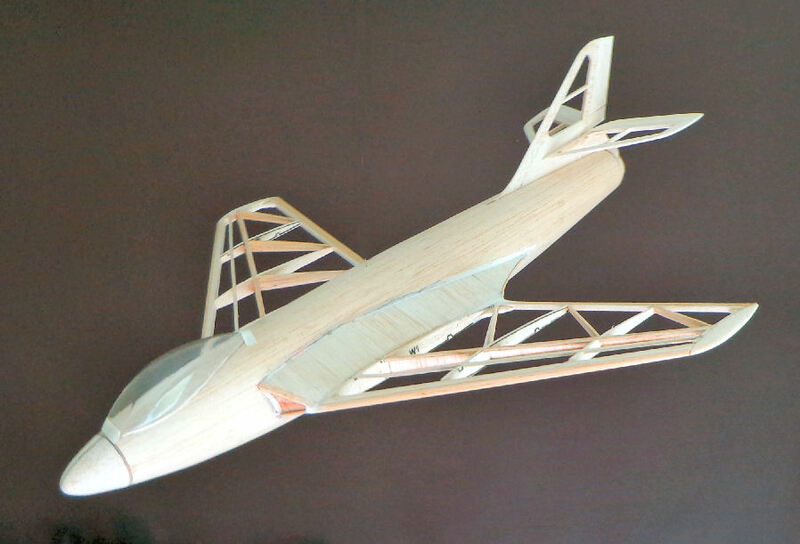 This can be carved later so the intakes etc will match the real thing. 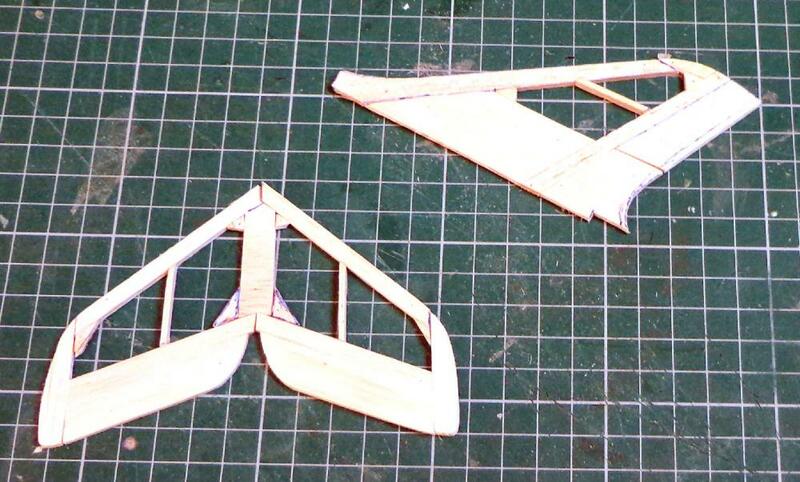 It then only remains to sand the fairings a bit where they meet the wing. Progress on a nice sunny morning has been slow, first task was to sand the tailplane and fin, seen below in their 'raw' state to shape and then cut the slots. Above: with the canopy taped in position it looks vaguely 'Hawker P 1081-ish' even if I think I've overdone the dihedral a tad. 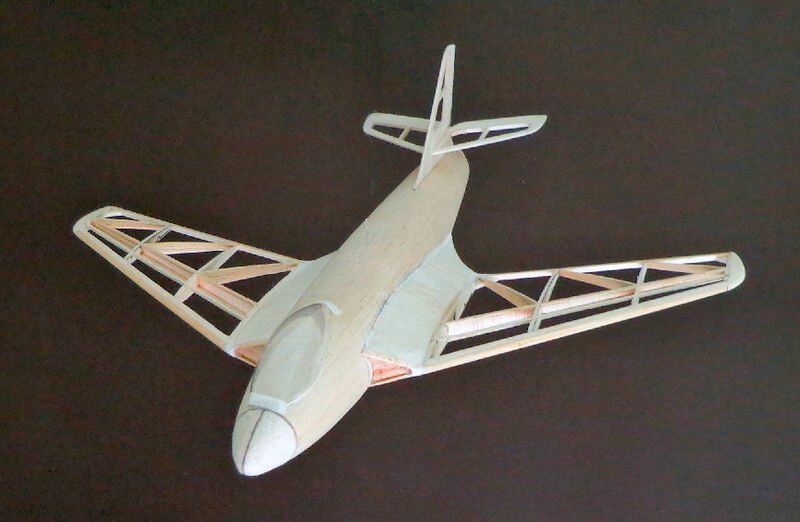 No bad thing for its flying characteristics, but retrospectively I might have been bolder. At this point it weighs 30.2 grams - a little over what I wanted, but if it's under 40 grams covered and painted it should go OK with a Rapier L-2HP as there is plenty of wing area. So, it only remains to smooth everything down, cover, add details, paint and add decals. This could take some time ... don't hold your breath. I’m very envious of the smooth body you have achieved with this technique and showing no trace of stringers. The model is looking really nice and with the higher power L2HP’s that we are blessed with at the moment, 40 grams should result in a splendid performance. I estimate the present L2HP’s put out around 300mN’s giving a power to weight ratio of 0.75 – all good and ensures a lively flight profile. 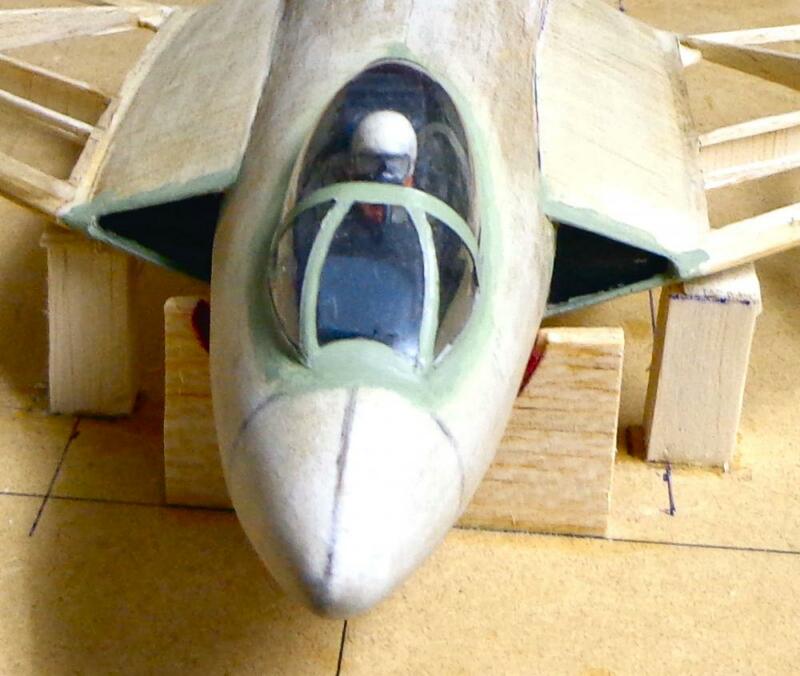 To illustrate my point my Swift is 43 grams and my Mig 15 was 35 grams (before I started rebuilding it) and both are well suited to the current L2HP’s. 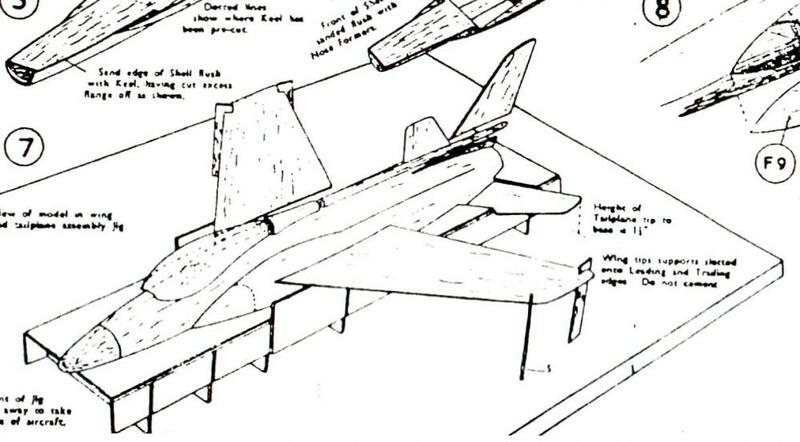 The Swift is 14” span and has an average fuselage diameter of just under 2 inches while the Mig is 16” span and the fus. is just over 2 inches dia., so both are fairly rotund (read draggy) but despite that they both fly very well, so your P1081 which looks to have a similarly portly fuselage should be a good ’un too. 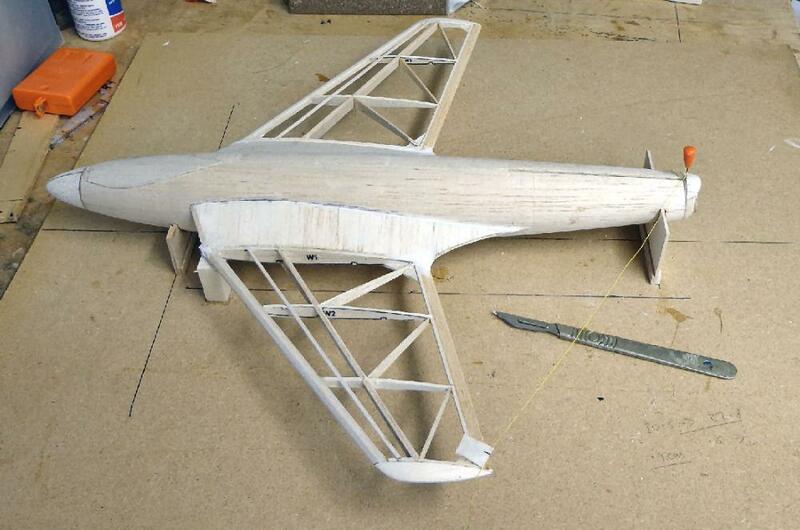 What a superbly professional P.1081 fuselage! It might well have come out of a Jetex 'Tailored' kit. It is a truism for any project that you can do 80% of the work in 20% of the time. It's the 'fiddly' bits that actually need the most attention, at least for a scale model, and especially if, like me, you have OCD (obsessive compulsive disorder) tendencies. So I've been busy covering the P 1081 fuselage and tail feathers with tissue and smoothing everything down to prevent the build up of too much weight. 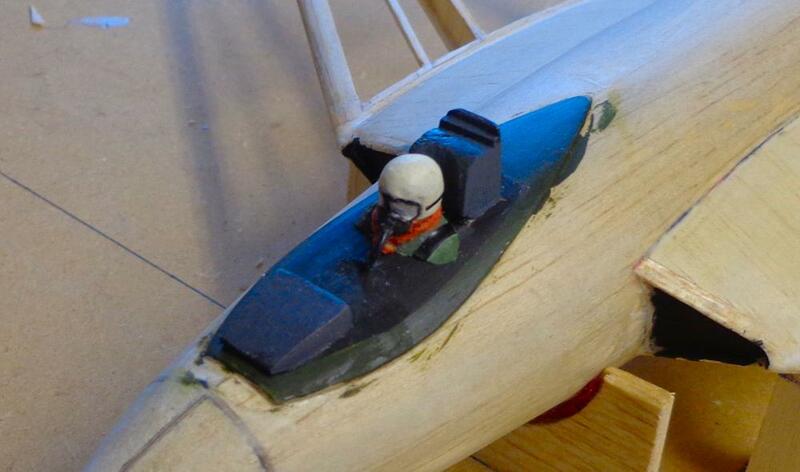 I then painted the cockpit area and glued in the instrument panel, ejection seat and Wimpy Wade. It was only at this point that doubts crept in: despite careful measurement and a comparison of photos was the pilot too big? Was Wimpy wade not 'wimpy' at all but a large man? Will I have to strip everything out and start again? What do you other guys think - does it look OK? Please don't spare my feelings! Yes there is no doubt about it he does look a bit large comparing your model with the pics I have just been looking at. I did an image search of the 1081 and the helmet appears to make it worse as mostly the pics don't show the pilot wearing a crash hat at all! Those were the days. There will be extremely few people knowledgeable enough to be able to comment on it authoritatively though so don't sweat it, he looks fine and in fact very cosy in there.